When cancer has spread to regional lymph nodes, it is often referred to as nodal involvement or regional disease. If cancer cells become lodged in distant lymph nodes or other remote areas of the body, however, the condition is usually termed metastasis or metastatic disease. Frequently metastasis occurs downstream from the site of the primary tumor, as liberated cancer cells move along the path normally taken by lymph in the lymphatic system or blood in the circulatory system. Yet, many metastatic growths form in locations unexplainable by circulatory means. 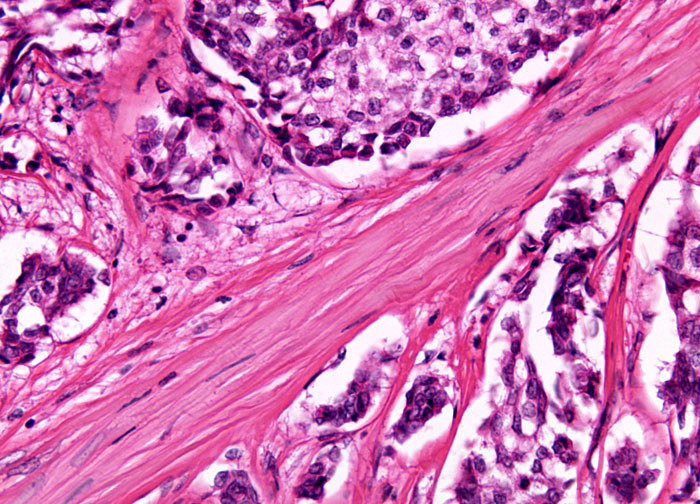 For example, prostate and breast carcinomas tend to metastasize to the bone tissue. Consequently, it is widely thought that cancer cells have a special mechanism that enables them to identify and target tissues that are particularly favorable to their growth.